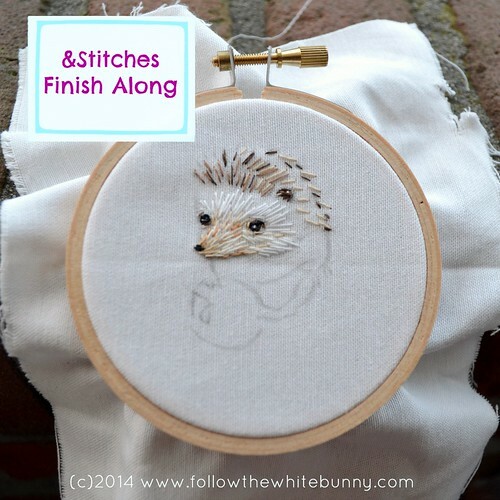 Follow the White Bunny: Embroidery Finish Along with me! Embroidery Finish Along with me! Over at the &Stitches blog we are hosting an Embroidery Finish Along and we'd love to have lots of people to Finish Along with us and complete an unfinished embroidery (or several!) from their WIP basket within the next month. If you'd like to join in, share a photo (and write something about your project) on your blog (or Tumblr/Flickr etc) and add your link to our Finish Along blogpost. Cool. I love your hedgehogs! Oh, how precious his little face is! Can't wait to see him finished!